A SuperMoon is a New or Full Moon which is extra close to the Earth, within 90% of its nearest approach to Earth in a given orbit. There can be 4-6 SuperMoons a year by this definition. In 2014 there are 5 SuperMoons – the two New Moons of January and the Full Moons of July, August and September. When a SuperMoon is a New Moon, observers on Earth cannot see it because its illuminated side faces away from the Earth toward the Sun. Helpful Image + Description A New Moon lies between the Sun and Earth. The only time a New Moon can be seen is during a solar eclipse, when it passes directly in front of the Sun, visibly showing off part or all of its entire dark disk. The closer the Moon is to the Earth the larger it appears and the greater affect it has on tidal waters, creating higher than usual tides. Some have noticed that the gravitational force of a SuperMoon affects the atmosphere and crust of our planet, as well as the surge of feeling and events on Earth. This web page highlghts the closest SuperMoon of the year that is a Full Moon. A SuperMoon that is a Full Moon appears bigger or extra full to those viewing it from Earth. A Full Moon lies opposite the Sun; the Earth lies between them. A Full Moon opposite the Sun is seen from sunset to sunrise. A SuperMoon is a perigee-syzygy event. Keep reading to learn more. Note: The exact Full Moon timing allows many observers to see an extra large Moon two nights—Saturday night, Aug. 9 and Sunday night, Aug. 10. In addition, if you're up before sunrise Sunday morning, look for largest Luna above the western horizon. BTW: In 2014 the Perseid Meteors vs.the Supermoon. Look northeast around midnight until just before dawn. Peak night for the Perseid meteor shower is August 12/13. 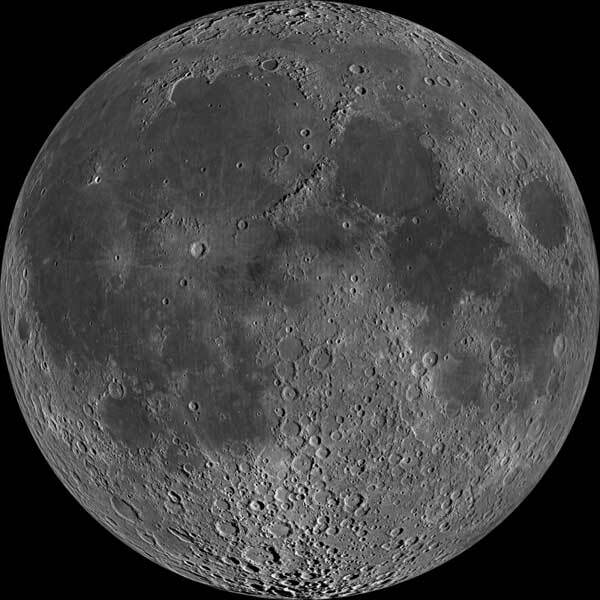 To find your favorite mare or large crater, just slide your cursor over this APOD Image; its web page gives APOD's full explanation and all the links for the "Lunar Nearside" mosaic shown above. The Full Moon of Sunday, Aug. 10, 2014 (11:09am PDT / 18:09 UT) is at a SuperMoon perigee, within 90% of its nearest approach to Earth in a given orbit. It is at its closest lunar approach for the month and for the year of 2014. At perigee the Aug. 10 Moon lies 221,765 miles from Earth (356,896 kilometers). 18 days or the 14th Full Moon after a perigee Full Moon. The biggest Full Moons of the year appear 14% bigger and 30% brighter than lesser Full Moons. Helpful Image A perigee Moon creates higher than usual "perigean tides". However, according to NASA, these are only a few centimeters (an inch or so) higher than usual. Local geography can increase the effect to about 15 centimeters (six inches). Richard Nolle has more to say about the potential effects of perigee SuperMoons in "The Sysygy" section below. A Moon near the horizon always looks bigger due to The Moon Illusion. Be sure to catch this two-day "Extra" Full Moon when it rises in the east Saturday, Aug. 9, around 7:15pm, sets in the west Sunday, Aug. 10, around 6:00am, and when it rises again in the east Sunday, Aug. 10 about 8:00pm. Click Rise/Set/Transit Times ~ Major Bodies for exact times in your area. When three or more astronomical bodies, in a gravitational system, form a roughly straight line, we have a syzygy (siz-i-jee). The Aug. 10, 2014 "Extra" Full Moon, as with all Full Moons, forms a straight line with our Earth and Sun (Moon-Earth-Sun), a syzygy. Richard Nolle calls the perigee-syzygy Full Moon a SuperMoon, which has the potential to stir up powerful tides in the Earth's atmosphere, crust and oceans. SuperMoon is a word I coined in a 1979 ... describing a new or full moon which occurs with the Moon at or near (within 90% of) its closest approach to Earth in a given orbit. ... At any new or full moon, Earth and Moon and Sun are all in a line: Earth is in the middle in the full moon alignment, while the new moon happens with Moon in the middle. This coming together in an alignment is technically termed a syzygy. ... when the Moon is in its perigee, or closest approach to Earth. Astronomers call this very special alignment a perigee-syzygy. I call it a SuperMoon – which is a whole lot easier on the tongue. ... From extreme coastal tides to severe storms to powerful earthquakes and volcanic eruptions, the entire natural world surges and spasms under the sway of the SuperMoon alignment - within three days either way of the exact syzygy, as a general rule. ... For most of us, the geocosmic risk raised by SuperMoon alignments will pass with little notice in our immediate vicinity. ... A SuperMoon is planetary in scale, being a special alignment of Earth, Sun and Moon. ... it’s planetary in scope, in the sense that there's no place on Earth not subject to the tidal force of the perigee-syzygy. Of course, earthquakes and volcanic eruptions don't go wandering all over the planet. They happen in (mostly) predictable locations, like the infamous "Ring of Fire" around the Pacific plate. The Aug 10, 2014 perigee-syzygy Full Moon line-up is grander, including Neptune, the Moon, Earth, Sun and Mercury. This solar system view for the exact time of the Full Moon shows Neptune (trident), Moon (not shown), Earth (blue), Sun (yellow) and Mercury (green). The SuperMoon (not shown in the image) and Nepturne are tugging on one side of the Earth while Mercury and the Sun are tugging on the opposite side of Earth. BTW: Mars (red) and Venus (white) are in syzygy alignment on opposites sides of the Sun. The Sun, now in its active cycle, a solar mini-max, already increases the likelihood of power grid overloads/outages and satellite disruption [*, *]. Gravitational tugging on our Central Luminary may mean more solar disruption. Solar activity may also increase earthquakes, volcanic activity and extreme weather [*], however this concept is not well understood nor agreed upon. Solar cycles and their activity can irritate one's physical, mental and emotional bodies and/or bring about a heightened sense of awareness [*], again this concept is not well understood nor agreed upon. Use Solar System Live to view the entire solar system or just the inner planets for any date/time. This Full Moon Festival is dedicated to the task of making contact with the energies of the star Sirius and its cosmic principle of Love and Freedom. The Leo-Sirius connection is key to humanity's spiritual evolution. This Full Moon Festival offers a great and unique opportunity to become aware of cosmic energies affecting humanity's evolution. Learn more at Sirius ~ Leo Cosmic Festival. The "Extra" Full Moon is part of a 5 celestial body line-up known as a syzygy (Neptune, Moon, Earth, Sun and Mercury). This syzygy is likely to disturb the quietude of the Sun, and stir up our Earth’s atmosphere, crust and oceans, and even irritate humanity's physical, mental and emotional bodies. In addition, at the time of a Full Moon our planet is the recipient of strong spiritual vibration and stimulation throughout the entire day from our Sun! At any Full Moon the Earth lies between the Sun and Moon. At this time the Earth, representing consciousness, is in direct alignment with our central luminary the Sun, representing Spirit. The Full Moon, representing form, acts as a reflector of the Sun's inflowing radiance for the entire night, from sunset to sunrise. A solar doorway opens wide and the unimpeded Spirit (Sun) works out in form (Full Moon) through the mediation of consciousness (Earth). A SuperMoon shines increased solar radiance our way for the evolution of consciousness and form. The Sirius~Leo Cosmic Festival Full Moon is bound to expand our consciousness with the help of cosmic energies. As we move with the seemingly chaotic currents and waves of our times, it is crucial to seek out and receive the energies that are streaming forth to help humanity emerge into something new, wholesome and universal.